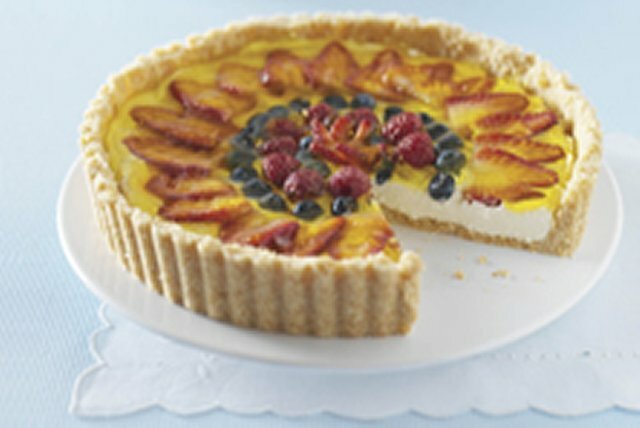 When you layer a cookie crust with cream cheese filling and fresh berries, a little fanfare is required. If you don't have a pedestal, be ready with a hearty "Ta-da!" Mix wafer crumbs and butter until blended; press onto bottom and up side of 9-inch tart pan with removable bottom. Freeze while preparing filling. Beat cream cheese and sugar in large bowl with mixer until blended. Gently stir in COOL WHIP; spoon into crust. Top with berries. Refrigerate until ready to use. Add boiling water to gelatin mix in medium bowl; stir 2 min. until completely dissolved. Add ice; stir until melted. Refrigerate 15 min. or until slightly thickened. Spoon gelatin over fruit in pan. Refrigerate 3 hours or until firm. This colorful berry dessert makes a great treat to share with friends and family. Place completely unwrapped package of cream cheese on microwaveable plate. Microwave on HIGH 15 to 20 sec. or until slightly softened. If you don't have a tart pan, you can use a foil-lined 9-inch round pan instead. Prepare tart as directed, pressing crumb mixture onto bottom and 1 inch up side of prepared pan. Fill as directed. Use foil handles to remove tart from pan before cutting to serve.